Partly to celebrate St David’s Day today – but mostly because it was long overdue, Clutch and I decided to try the samples of Penderyn that the Welsh Whisky company had kindly sent us. Custard, vanilla, tangerine, honey-roasted peanuts, tiny touch of smoke. Flumps. Seriously: Flumps. 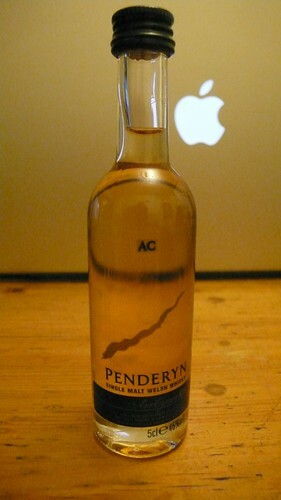 Also, condensed milk, cream toffee… Penderyn is a dessert whisky. Very smooth, rounded, unassuming, a little astringent. Quite quaffable, very enjoyable. A lovely dram that would welcome newcomers to the world of malts… and a lovely way to finish off St David’s Day. I can’t help noticing the Apple behind the whisky. Is this some new venture Mr Jobs is exploring? Or does a combination of Apple and the consumption of whisky explain their current travalis with the iPhone4…??! Oh wow. I wish I actually had some taenlt in the kitchen. I think I need to lovingly suggest this recipe to my girlfriend. I wonder what other sort of desserts could be made with whisky/bourbon/scotch..
I’m not looking for a fight or judging…I’m just confused. So many celebs who’ve declared themselves vegan do an aboutface when pregnant, yet claim they’ll go back once baby arrives. If they are vegan because of animal rights or real health beliefs they wouldn’t flipflop just because of cravings. Why are they vegan in the first place then? Can somebody enlighten me? > ChissÃ che magari a qualche vicedirettore Rai, o a chi nomina i vicedirettori, la cosa possa dare qualche piccolo spunto di riflessione.Se la nota trasmissione ha successo di pubblico (e temo che sia cosÃ¬) le speranza sono veramente poche: l'unico criterio adottato Ã¨ quello!